Ellis Credle (1902-1998) was an author and illustrator of books for children and young adults. Born in North Carolina, she attended Louisburg College and the New York School of Interior Decoration. Her first children's book 'Down, Down the Mountain' became a Junior Literary Guild selection. 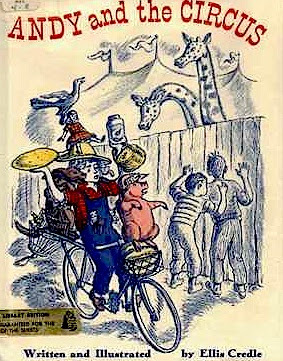 The running-away- to-the-circus theme has always been wanted. A book that is seldom seen without library markings and often lots of them. Ex lib copies seem to be available at less than $80, but there are dealers, not part of the usual coterie of overpricers asking over $200 for ex lib lite copies. One dealer describing his copy as 'retired' from a library then promotes the book as being sturdy because such books are often reinforced at the spine. Ex Lib is nasty and to be avoided, imho they are only OK if v cheap or you merely need the text or the book is otherwise unobtainable. Ex library books have usually been purchased for a dollar or at a dollar a pound weight so theoretically the seller has room to negotiate ('wiggle room') so it is worth making an offer if you really need the book. It is unwise to do this on massively overpriced books. In my experience price = character and a gross overpricer is likely to be a difficult and intransigent person, possibly disturbed, and is best left in their misery. Caveat emptor. VALUE? An ebay favourite -the customers there can probably swallow an ex lib book more readily. Do you really want to spend $150 on a second edition described thus- "Book has tape on the cover from dust jacket being taped to the book, library pocket and markings, scattered light smudging on some pages, not affecting text; otherwise, pages mostly clean. A 1/4" closed tear at bottom of one page. Dust Jacket is price-clipped. Protected by a clear Gaylord cover taped to the book. A 1/2" closed tear at bottom of back flap..."